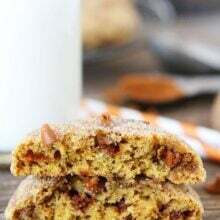 Pumpkin Cinnamon Cookies-soft pumpkin cinnamon cookies with cinnamon chips and finished with cinnamon and sugar. These are the BEST pumpkin cookies you will ever eat! I hope you are ready for pumpkin recipes because I am sharing the BEST pumpkin cookie recipe today. These Pumpkin Cinnamon Cookies are hands down the best pumpkin cookies I have ever made or eaten…and I have made and eaten a lot of pumpkin cookies in my lifetime. 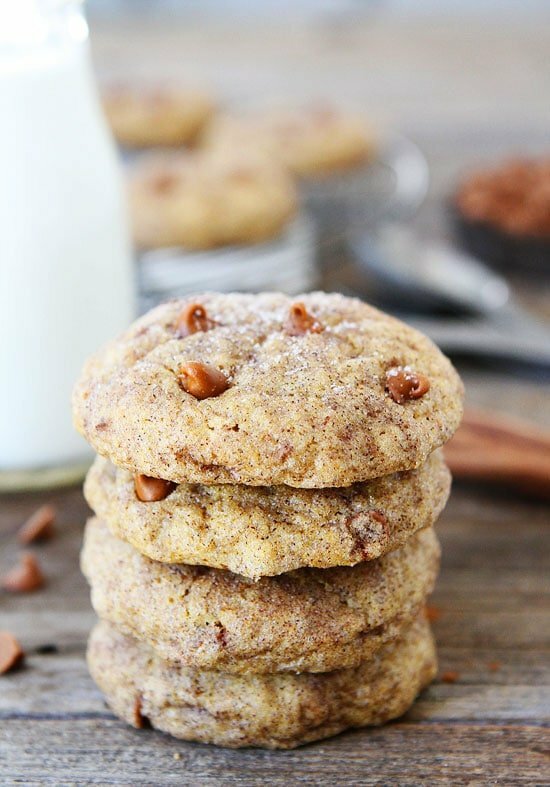 I love all of my pumpkin cookie recipes, but these Pumpkin Cinnamon Cookies are my new favorite. 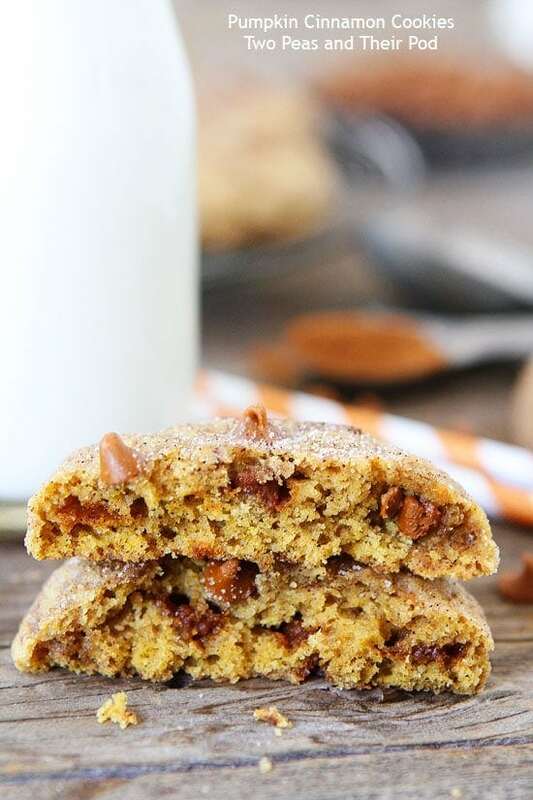 Sorry other pumpkin cookies, I hate to pick a favorite, but these Pumpkin Cinnamon Cookies are number one in my book now! I am madly in love with them! I really wasn’t planning on blogging about these cookies until later in the fall, but I shared them with two friends and they both text me asking for the recipe. They both loved them! One of my friends even said that these cookies are not only the best pumpkin cookies, but the best cookies ever..out of all the cookies! She said these cookies will be in heaven’s cookie jar:) I am fine with that! Pumpkin cookies traditionally have cinnamon in them, but I upped the cinnamon by adding an extra healthy dose of ground cinnamon to the dough. I also added cinnamon chips! If you haven’t baked with cinnamon chips, you are missing out! I can usually find them at the grocery store, but if I can’t I order them from Amazon. I love them and they are a MUST for fall baking. 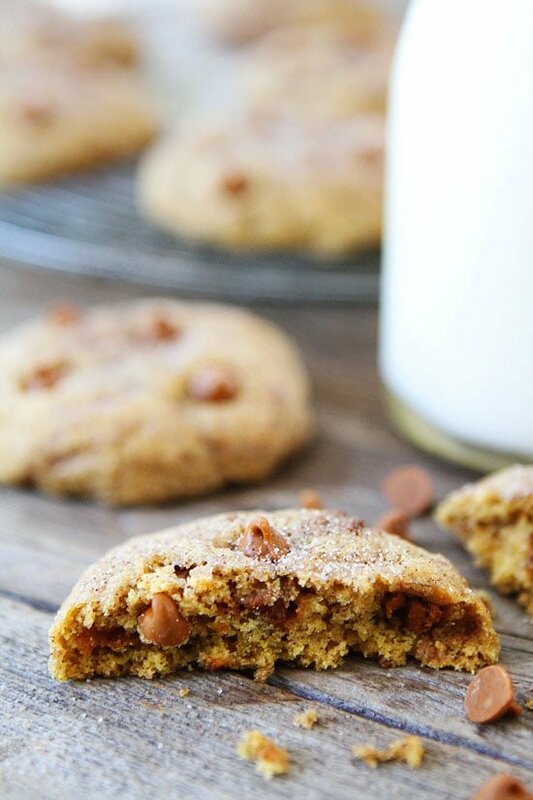 I suggest you stock up because you are going to be baking a billion batches of these Pumpkin Cinnamon Cookies after you taste them. I am already going on my third batch. To finish off the cookies and to keep with the cinnamon theme, I roll the cookies in a cinnamon sugar mixture before baking. The mixture adds a nice sweet touch and makes the cookies extra purty! So go ahead and bust out a can of pumpkin. 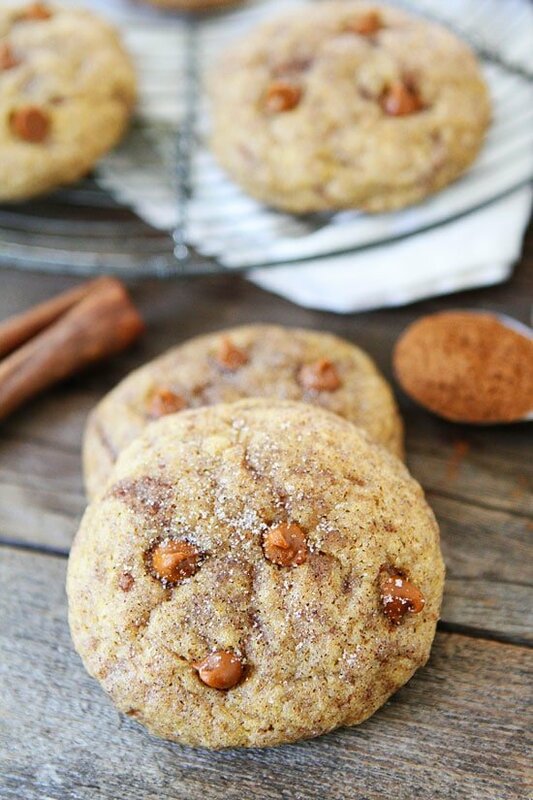 It is time to make these Pumpkin Cinnamon Cookies. Trust me, you NEED them ASAP! 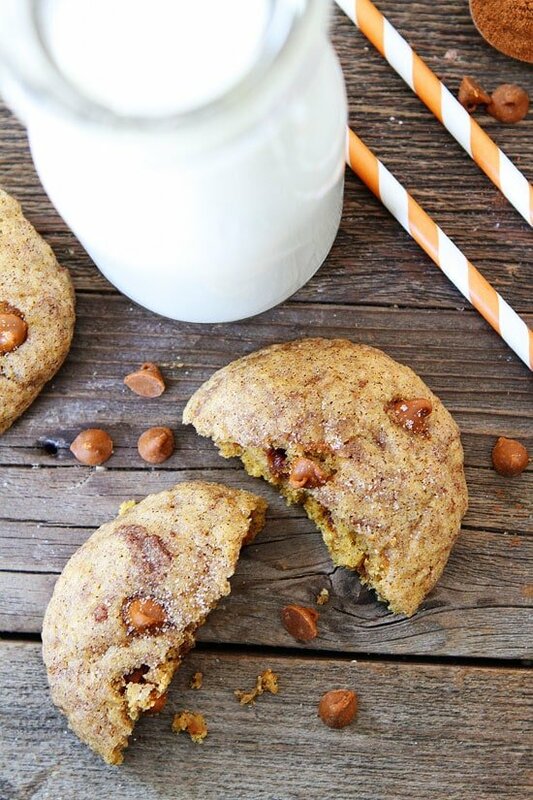 They are the perfect pumpkin cookie! Add these cookies to your fall baking list! They are the BEST pumpkin cookies you will ever eat! In a medium bowl, whisk together flour, baking soda, baking powder, salt, and spices. Set aside. Using a mixer, cream the butter and sugars together until light and fluffy, about 3-4 minutes. Add the pumpkin, egg, and vanilla and mix until combined, about 3 minutes. Slowly add in the dry ingredients. Mix until just combined. Stir in the cinnamon chips. In a small bowl, mix together sugar and cinnamon. Shape dough into rounded tablespoons and roll in the cinnamon sugar mixture. Place balls 2 inches apart on prepared baking sheet. Lightly press down on the cookies with a spatula or the palm of your hand. Bake for 10-12 minutes or until cookies are just beginning to brown around the edges. Let the cookies cool on the baking sheet for two minutes. Transfer to a wire cooling rack and cool completely. Note-I can usually find cinnamon chips at the grocery store, but if you can't find them, you can always order cinnamon chips from Amazon. Gotta love a big puffy cookie like this. Yum! I’ve never tried cinnamon chips! Where have I been this whole time?? There is SO much spicy goodness going on in these cookies that I ALMOST can’t handle it. Those cinnamon chips are the perfect addition – yum! Pinning! I’ve been more cinnamon-crazy than pumpkin-crazy lately, and these would really hit the spot. Thanks for sharing!! These cookies have pretty much all my favorite things in them. And, they are soft! Oooooooh! Can’t wait to try making them! Thanks for sharing these now, rather than later on in the fall. 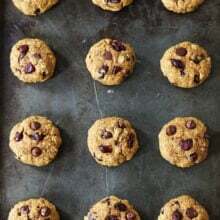 I just bought another bag of Hershey’s cinnamon chips and will be using them in these cookies! Looks like you can buy the chips for less at the Hershey’s store online. They are not available in stores in Canada, will need to look for them the next time I visit the States. I hear that there have been sightings of these chips at bulk barn. I am going to check them out! You should try them! They are my favorite! It doesn’t get much better than this — Fall in a cookie! Love that you used cinnamon chips and topped them with cinnamon sugar. YUMMY!!! Pumpkin comes in a couple of different sized cans – how many oz would 3/4 of a can be? Can’t wait to try them! Thanks. You need 3/4 cup pumpkin so a 15 oz can would do it! Enjoy! I love cinnamon chips too! I just found pumpkin spice chips the other day as well. You need to pick up a bag or two of those, Maria! I will have to look for those! Thanks for the heads up! These cookies look great and your pictures are beautiful!! Reminds me of a pumpkin snickerdoodle. Yumm. Was planning on making a batch of doodles this weekend for my son, now I’ll transition to your recipe! This is great! Such perfect timing you have. I was going to make chocolate chip oatmeal, but this will definitely be more appropriately seasonal (tomorrow!). And not only that, but I was going to do pumpkin muffins so I’ll have something to do with the rest of the pumpkin in that 15oz can. Thanks! I love all of the spices – especially the cloves! I’ll never say no to a pumpkin cookie!! Love! Love the flavors in this and all that cinnamon!! Yum!! They look like pillowy-soft-chewy heaps of pumpkin-cinnamon heaven! DELICIOUS! I need to break out the pumpkin because before I know it our Saskatchewan winters will be here! Can’t wait to try those. LOVE cinnamon. Can’t go wrong combining cinnamon chips and pumpkin! These look amazing. I’ve been on a search for a good pumpkin donut or scone, but cookies will always do the trick! I love using cinnamon chips with pumpkin! These look great! I wish I was eating one of these right now! I love those cinnamon chips! These cookies look wonderful, Maria! What a great fall dessert! These look fantastic! Is it possible to substitute the cloves, ginger, etc with pumpkin pie spice? How much would you reccomend? I haven’t used pumpkin pie spice, but I am sure it would work! Maybe 2-3 teaspoons? Sounds like a must try cookie! I could seriously eat a dozen of these. Amazing! I can see these becoming my favorite pumpkin cookies, too! LOVE the cinnamon sugar topping. A perfect addition! These sound like pumpkin snickerdoodles to me and because of that I MUST HAVE THEM. Yummy! Can’t wait to try and share! So glad you like our cookie recipes! OMG these cookies!! I left work, drove to Wegmans to buy cinnamon chips and made these IMMEDIATELY!! Thank you, thank you. Another homerun! These look amazing!!! The texture looks incredible, and they have so much spice! Definitely need to make these. Wow I can only imagine how tasty these must be! Thanks. Made them – awesome. Used butterscotch chips – had no cinnamon chips. You are right. These cookies are amazing. Plus the house now smells totally wonderful. Made your glazed lemon cookies and chicken orzo lemon soup so far. Your site is my go to place for perfect recipes. Thank you!!!! They are too good, huh? 🙂 So happy you are enjoying our recipes! I made these for the first time Thursday night to take to work Friday and they were a BIG hit! I didn’t have cinnamon chips so I used butterscotch chip instead and they were good. I’m lucky enough that I am one of those people who Maria brought these cookies to! I feel famous;) ABSOLUTELY THESE ARE AMAZING. Simply amazing. They are incredibly appetizing to look at and unreal to eat. Cinnamon chips are amazing and the whole cookie is seriously just amazing!!!!!!! I haven’t tried making cinnamon chips. You can order them online. I included a link in the post! First time commenter, long-time reader… I made these cookies last night after saving them since you posted… they are AH. MAZ. ING. It was late so I just baked a dozen (will bake the rest of the dough today), but my boyfriend and I ate every single one in the first batch. He said they were one of the best cookies he’s ever had EVER. Thanks for such a great recipe!! So happy you liked the cookies! Thanks for reading our blog! I’m going to bake these this morning, but do you use Pumpkin Purée , or Pumpkin Pie Mix? Puree, not pumpkin pie filling! These are amazing! I used half the sugar and were still delicious! These look amazing! Could I use salted butter and omit the 1/2 teaspoon salt? I have all of these ingredients except for the cinnamon chips. I live out in the sticks and it’s 20 minutes each way to the nearest store that would have them. So I was wondering if I could sub dried cranberries or raisins or pecans. They sound wonderful and might. be good without any of these additions. Thoughts? Could I make this batter a couple days ahead of baking? Looks delicious! Yes, just keep it in the fridge! I love this recipe! However, I couldn’t find those darn cinnamon chips, so I used pumpkin spice chips which I found at Target and they are delicious in these cookies! Thanks for yet another fabulous cookie recipe! my dough was too sticky to roll. I used store brand pumpkin. I refrigerated dough for an hour prior to baking. I was afraid to add more flour. Delicious! Anyone else have too moist dough? Love your cookie recipes… Have made many and repeat them often. I made these yesterday. Oh. My. Gosh!!! They are SCRUMPTIOUS!!!!! This recipe is a keeper! I use a Pampered Chef cookie scoop and level it off on the edge of my batter bowl so my cookies are a uniform size. I got 70 cookies with this recipe. They are about the diameter of a Girl Scout cookie, just in case you are curious about the size. I can feel like I’m really indulging when I have 2 of them that way, rather than one single “blew today’s diet” cookie. Is it ever too early for pumpkin cookie recipes?? 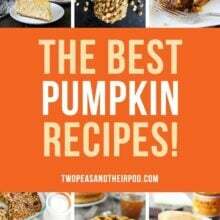 I can imagine this recipe being a hit with any pumpkin lover! I have some leftover pumpkin pie filling that I want to use up– do you think I’d be able to substitute it for the pumpkin and spices here? Not sure if that would make the dough too soft or runny. Thanks! These cookies look SO good! Oh dear. I just made these. I hope they make it to my event tonight. They are so good! i just made these and they are absolutely delicious!!! Thanks for the recipe. I made a test batch tonight and I think that I did not use enough pumpkin. I used about half the Libby’s can, is that what you found? Also, my batter was extremely sticky so hard to coat in the sugar – was that normal? I am in Europe so not Cups to hand. First time using cinnamon chips and holy moly are they yummy!!! I can’t believe we don’t have them in the UK! Looking forward to seeing what people think! This recipe, unfortunately, didn’t work for me. The dough was very sticky even though I added extra flour. The cookies turned out mounded instead of flat. They tasted more like muffins than cookies. Maybe it was something I did wrong. Oh well, store bought cookies for classroom party tomorrow. I made these last night and they really are the best I have ever tasted too! I was afraid the cinnamon chips might make them too spicy, but they were perfect! My supermarket only carries cinn chips seasonally, so I have been anxiously awaiting their arrival! They came in yesterday, and I made the cookies last night – they are awesome. They are very light…like a mini pumpkin bread with cinn chips! These are my new favorite cookies. I have made them 3x in the past month and I’m about to make a double batch after I get my kids to bed! My husband was skeptical because he’s not a huge fan of pumpkin but he is now addicted to them as well! Thank you for the great recipe! Also, the dough was sticky but as the recipe stated, I was able to shape the dough into balls (definitely would not be able to roll) and once I rolled the balls around in the sugar mixture they were a lot easier to handle. These look magical!! Do you know if they freeze okay? do you think you could add oatmeal to this? Love, love, love these! Making them for a cookie swap as we speak. The key is refrigerating the dough before rolling. The first two times I made these, I refrigerated the dough for a short time before rolling out the first sheet of cookies, then refrigerated the remainder of dough between batches. Today, I ended up refrigerating the dough several hours, and so far, so good. I wouldn’t add anything to compensate for the stickiness…just refrigerate. Perfection! These are delicious! My husband wanted to know why haven’t always made these (and he’s picky). Thanks for the recipe and Merry Christmas! 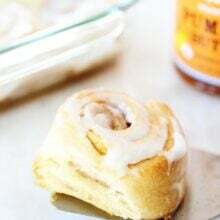 I made these with Penzey’s China Cinnamon Tung Hing Cinnamon, and they were totally awesome! Have you tested these out with nuts or rolled oats? Hi! I made these last year and loved them! I’m wondering if you’ve ever tried freezing the dough instead of baking them right away? I made these and they are DELICIOUS.. Took a plate to work and they were devoured, asking if there were any left. My only complaint is that the dough is a little wet so making balls wasn’t an easy task. I used my small cookie scoop then rolled. Just took a little time. But, that said, I will make them again because they are so very, very good. when you say canned pumpkin do you mean the pure kind with nothing in it?or do you mean the kind that has all the spices in it? hi ive just come from the states looked all over for cinn chips,i cant find them,im from Canada and ive checked here too. do you think I can use white chips?i so wanted to make these today and im sad I cant get those chips they sound so yummy.where do you get yours from? If you can’t find them in stores, you can buy them from Amazon or King Arthur. These were amazing! I have to make myself stop eating them. the perfect amount of spice and stays soft in the middle! excellent milk dipper. and don’t hesitate to use chocolate chips… just as good = ] They do stay puffy if you don’t really press them down before baking. Excellent cookie. Thanks for the yummy snack! Is this calling for puree? Or filling? I just made these this afternoon. I love pumpkin and all the spices that go along with baking in the fall (nutmeg, cinnamon, cloves, and ginger). These cookies did not disappoint! They are absolutely delicious! Thanks for sharing. I guarantee this recipe is a keeper and I will make them over and over again! Yummy! Oh! I should have included this fact: I don’t usually leave comments for recipes! I felt this recipe deserved a two thumbs up! Thank you for taking the time to comment. I am so glad you liked the cookies! I’m looking forward to trying this recipe later today. I could not find cinnamon chips anywhere so I finally contacted Hershey directly. The gave me two stores in my area that carried them. Only one was in my zip code. WOW. What a recipe! Probably the best pumpkin cookie I’ve ever had. It’s soft without crumbling, full of sweet spicy goodness, and it’s a great companion to coffee or unsweetened apple cider. I made a couple of batches last Thanksgiving for my family, and they were such a hit that I had to make them a couple of times a week for the rest of the holiday season. I also took two dozen of them to the Christmas party at work and came back home with no leftovers. I ended up making so many batches of these cookies throughout December that by New Year’s, I could practically bake them in my sleep. I’ve also tried the recipe with white chocolate chips (for my mom) and dark chocolate (for my best friend), and both are good, but for me, the cinnamon chips really make it. My local grocery store kept them in stock all through last holiday season. Hoping for the same good luck for this year’s round! My relatives and friends are *already* asking me for these cookies — for a picnic, for Halloween, and, of course, Thanksgiving and Christmas. You were right, I’m going to be making billions of batches. Thanks! I can see why you say these are the best! I’m obsessed with cinnamon chips. I could eat them right out of the bag. Sorry to say I’m so disappointed in these, because they sounded so good. I followed the recipe exactly. The dough was way too soft and moist to roll into balls, and I didn’t have time to refrigerate for very long. I put the dough on the sheets by rounded spoonfuls and then sprinkled them liberally with the cinn-sugar mix. The cookies have a cake-like texture and are not very flavorful. I was expecting them to be chewy with crunchy edges, but no…just cake-y. Sad. I know some people like that texture in a cookie, but I’m not one of them. I had to make these, but couldn’t find the cinnamon chips – I think it’s a little too early to find them in the stores. I did have a bag of pumpkin spice chips, so I used those. The cookies got raves from the group I shared with. I’m making another batch right now for my husband’s chemo nurses. I added some chocolate chips with the pumpkin ones. These are amazing! I can’t wait to try them with the cinnamon chips! It is a moist dough due to the pumpkin, but you should be able to form cookies with no trouble. I have never had a problem. You can chill the dough to see if that helps. Sorry you are having trouble, I’ve never experienced this. These are so good! I made them for a church picnic and they had rave reviews. Thanks for sharing–I am adding this to my permanent recipe collection. Hubby LOVES these! He’s hates chocolate so these are a hot for the whole family. I always end up with a really wet dough – and use about a 1/4c flour when rolling so it’s not so sticky. Is this normal? the dough is a little sticky, but you should be able to roll them. These are freaking unreal. I just had 1.5 (shared the half with my toddler) off the cookie sheet and it’s taking ALL of my willpower not to eat 5 more. I was too lazy to roll in sugar, and am happy to say they still taste perfectly delicious. Will be making these again this week I bet lol. Thanks so much! I “need” more pumpkin recipes to help use up all of the wonderful puree I have made from my pumpkins! And I see a short prep time in the recipe, which always adds to my joy in baking. 🙂 Can’t wait to try these. They are my favorite! I hope you like them too! These cookies sound awesome!! I just have one question…what size is the can of pumpkin? I ask because I have 2 sizes, one large, one small. I’m guessing the larger one? Ooops…thats’ 2 questions, lol. You need 3/4 cup of canned pumpkin, the small can will be enough. I added tiny bit of floor to help with sticky . Baked full 12 minutes. I do think I want to try smaller portion. Could eat them all by myself. Still trying to find the chips. Nice…! i love cookies and your cinnamon cookies looks so yummy and delicious. Thanks for sharing and keep shared your new recipes….! I made these today!! I couldn’t find cinnamon chips but I did find pumpkin spice chips. My house smells wonderful. The husband and son said they are great!! Amazing !!!!! My cookies came out Light & Fluffy . I did white chocolate chips since , I could not find the Cinnamon chips . Still turned out great . Will make it again & order the cinnamon chips . I’ve made these cookies multiple times. 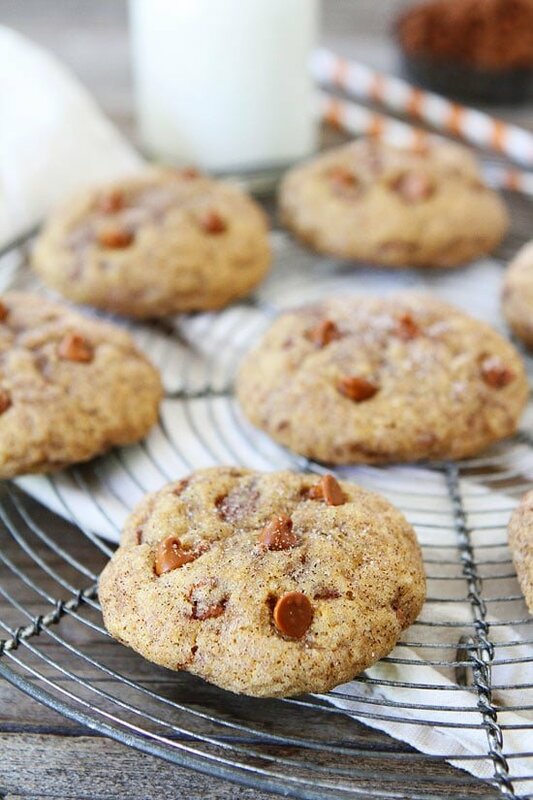 Although it’s hard to find the cinnamon chips, when you do these cookies are aMaZiNg! I used pumpkin chips I found at Wegman’s! Amazing!! These look and sound delicious! I have never used cinnamon chips before and will definitely be looking for them at the grocery store this morning! Once I heard cinnamon chips, a flurry a baking ideas came 🙂 One of the reasons I love the fall and winter seasons is all the pumpkin recipes. I LOVE pumpkin. These cookies just sound so amazing! I was excited to find cinnamon chips (Hershey’s) to make this keeper. KAF has a wonderful banana muffin recipe using them. I like that this pumpkin recipe doesn’t have nuts, because I put nuts in everything I bake. Very nice change. I have made these cookies twice and they are delicious.. however mine are much darker than shown in the picture ( not over cooked) and I followed the directions exactly as in the recipe. Can you think of something that I could have done wrong.. I just like the look of the lighter colored cookies.. 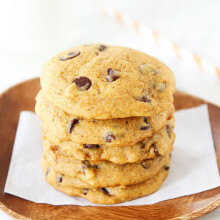 Sorry another comment… I just realized after reading the recipe for the 100th time that I used a full 15 oz of pumpkin ( the smaller sized can ) vs 3/4 cup.. do you think that caused the cookies to be darker than what is in your picutre.. I love this recipe. I’ve made it numerous times now. I have one issue every time I make it. My dough is always so sticky. I have added extra flour but that doesn’t seem to do anything. I will admit I don’t have the best mixer. Just a cheap one. So maybe that alone is my issue. Is there any thoughts as to what I can do? The dough is a little stickier than most because of the pumpkin. It shouldn’t be too sticky to work with though. You can use a cookie scoop or spray your hands with cooking spray to help form the cookies. How many calories in a cookie? I have not tried this yet but plan on making these this morning & wondered how much extra cinnamon you add to the cookie mix ??? What if I am using pumpkin pie spice instead? How much shall I use? I would use 2 to 3 teaspoons. I made these with salted caramel chips, since I couldn’t find cinnamon chips on short notice. I also used salted butter and eliminated the extra addition of salt. They came out delicious and disappeared in a matter of minutes! Awesome!! !My family and friends Loved them. I made them last year about this time. My family is requesting them again.